On May 14-15, the 2nd Annual Bay Area Spring Showcase hosted by Student Athlete Camps and Mid Major Hoops Report took place at Merritt College in Oakland, California. Mid Major Hoops Report had an opportunity to observe and evaluate over 200 players. The list below does not project college potential or take into account prior accomplishments. These notes are based on performances during the event only. Sid Rao Saints Basketball 15U: He is a good spot up shooter from the 3 point area. Must improve on shooting off the dribble. Isaiah Saams-Hoy Saints Basketball 15U: He is an athletic slasher who finishes with rim attacks. Justin Traina The University JV: This lefty is a knockdown spot up shooter. Dominic Simpkins Each One Teach One: He has mid range game. Also, he demonstrated the ability to hit the 3 ball spotting up and off the dribble. He needs to improve on shot selection and not pre-determining his moves. Melvin Lipsey III Oscar Grant Ballers: He has good vision and passing ability. Also, his good first step allows him to get to the rim at will and finish with consistency. Brandon Beckman NBBA 16: Quick hands that leads to steals; good on ball defender; vision and passing ability; surprisingly athletic; fronts ball in transition; passes were on a dime; struggled with his shot on Saturday, but was more consistent on Sunday; nice rim attacks and finishes. Miles Squiers NBBA 15: Mid range game; high motor; moves well without the ball; finishes at the rim consistently; reminded me of a young Tony Parker. Rustin McManis Saints Basketball 15U: He is a good spot up shooter from the 3 point area. 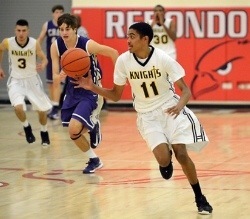 Jason Rodriguez Team Dynasty: He is a very good spot up 3 ball shooter. Will Charvin Splash City: He has a nice pull up jump shot and attacks the rim at will. Emmanuel Adeoye NBBA 15: Long; athletic; raw; African kid; He got better throughout the day that I saw him play. Matt Redmond NBBA 16: He is a shooter with range. 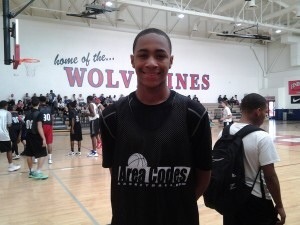 BJ Shaw Oakland Soldiers: Struggled on Saturday, but came out on day 2 and showed 3 ball, mid range, and rim attacks. Play Top Central and Northern California Competition.Get Evaluated by the West Coast’s and the Nation’s Top Scouts Like Ronnie Flores (ESPNhs.com/CalHiSports) Frank Burlison (Burlison on Basketball), Dave Keefer (California Preps), Johnny Hernandez (Ball is life), and Gerry Freitas (Hoops Review).Each Player Plays in two (2) Showcase Games (each player plays at least half of game).Player/Game Stats Provided by California Preps.All Players Included in Special Super Showcase Report sent out to college coaches.Everyone Receives a Super Showcase Uniform Top (Bring shoes and shorts). 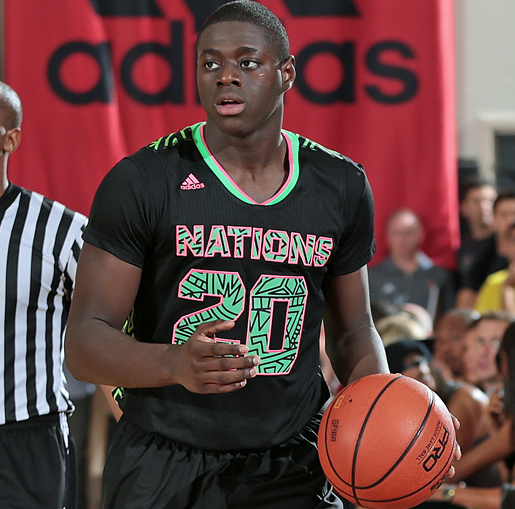 As the final days of the summer 2015 basketball season ended, we were able to catch up and spend some time with New York 5-star and one of the nation’s elite guards for the class of 2016, Rawle Alkins. Rawle is a fierce competitor and a force to reckon with on both ends of the court. His tenacious offense and defense has led him to becoming one of the most sought out prospects in the country. A young man with great character, as he exhibited this at the Adidas Global Nations, when he invited an injured, Dennis Smith into the huddle for the celebration. Rawle has a bright future ahead of him and we definitely wanted to take this opportunity to get to know him a little better! RA: I am 6’4, 220Lbs. RA: The New York Rens. 4. Describe your game for coaches and fans who have never seen you play. RA: I am an aggressive guard, always on attack mode. I know how to create for myself and others. I believe I can shoot well and I am just a winner. RA: Everyone is athletic, everyone can do a lot of the same things. My motor doesn’t stop. RA: My shooting and my ball handling. 7. What aspect of your game are you working the hardest to improve? RA: Everything, I feel like I can and need to work on every part of my game. RA: Well, the schools that I have cut my list to. 9. Who are some of the college coaches that have made an impression on you and your family? 10. Do you have a top five to ten school you’re looking at right now? RA: Yes, I just released my top 10: Kentucky, North Carolina, Texas, Kansas, St. John’s, Louisville, NC State, UNLV, Maryland and Indiana. 11. What schools have you visited ? Do you have any visits planned for the future? RA: No, nothing planned right now, just working on prep school. RA: Every day, I will catch my flight home to New York, then when I get home, I will be back in the gym. 14. How old were you when first picked up a basketball? RA: I was about 5 years old. RA: Atmosphere, I want to play where it is a family, not just feel like it’s a job. RA: Well, I don’t have a personal trainer, I have been working on my own. 17. What is your favorite moment as a basketball player so far? RA: I think winning the 3rd New York City title. I felt more a part of the team that 3rd year! 18. What are some of your short term goals/ long term goals? RA: Haven’t really thought out short term goals. Long term goals, besides basketball, I want to try to take up acting in the future or become an actor. 19. What style of play do you prefer? RA: Up tempo and team basketball. 20. Who is a player in college basketball or the NBA that you really respect? RA: I respect all of them even though I don’t know them personally. But I respect them because they are there and they made it! 21. Tell the world something about Rawle Alkins that people might not know. RA: Well, my mom raised me and played both roles in my life. People think that because I am a kid from New York that I am aggressive. But, I am open and I talk to everyone. I feel that I am a friendly person. 22. Do you have a Facebook , Twitter, IG? On May 16-17, Mid Major Hoops Report ventured to Oakland, California to cover Team Select/SF Rebels’ Warm Up 2 Reno. Team Select was started in 2009 as a non-profit organization benefitting youth in the areas of education, life skills, college placement, network building, philanthropy, and athletics. On Saturday and Sunday, Mid Major Hoops Report covered the high school divisions at Jam Town. One of the top 2017 prospects in the Country out of the State of Nevada, Charles O’Bannon Jr. of Bishop Gorman High School (NV) has been showing out grabbing major attention from college recruiters and media outlets. Mid Major Hoops Report has invited him to our “Players Corner” where we at Mid Major Hoops Report are proud to highlight him and give us insight into his recruitment at this time…. CB: I see myself playing a shooting guard or a small forward. CB: I am a scorer ,very vocal, and love to do the small things to win games. CB: I would have to say my scoring ability and the fact that I like to slash. A slight advantage when my opponent thinks all I do is shoot . CB: My ball handling by far, it has improved and will continue to improve. CB: My defense, I am okay on defense but I want to be a great defensive payer. 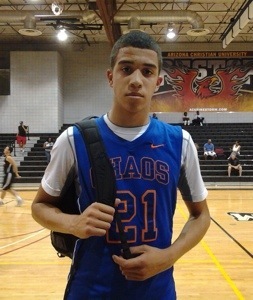 CB: Tulsa, Southern Utah, Arizona, Pepperdine, Washington, Notre Dame and I have gotten an offer from UNLV. CB: Rick Pitino and Jim Harrick. CB: I have visited UCLA, Duke, NC State, North Carolina, and Wake Forest but, I would also like to visit the ones that i listed above. CB: Thats not a factor for me. CB: I put in tons of work in the gym. Between 3- 6 hours a day. CB: About 5 years old. CB: The coaching staff and the style of play that the team’s offense is set up and the environment. CB: Winning the Fab 48 last year because we came back from being down by 26 points and came back to win the championship. CB: To win another state championship. CB: To go to a high-major college and onto the pros. CB: I prefer a Kevin Durant type of play. CB: Kobe Bryant because he has made it clear that no one in the world can guard him and that he will score on anyone. Also people can’t be compared to him after what he has done in the past 17 years of his NBA career. Special Thank You to the O’Bannon Family for allowing MMHR to conduct this Q&A with their son. Please keep in touch with any up to date recruiting news. One of the top 2015 prospects in the Country out of the State of California, Stephen Thompson Jr of Bishop Montgomery High School (CA) has been showing out grabbing major attention from college recruiters and media outlets. Mid Major Hoops Report has invited him to our “Players Corner” where we at Mid Major Hoops Report are proud to highlight him and allow him to give us insight into his recruitment at this time…. STJ: Combo guard 2 and 1. STJ: I shoot the 3 ball. I play at an up tempo pace. Defensively, I use my length for steals and deflections. STJ: My 3 point shooting. STJ: I would say my strength. Also, I am better defensively, especially on the ball. STJ: Arizona State; San Diego State; Gonzaga; USC; Creighton; Stanford. STJ: Coach Sendek from Arizona State and Coach Enfield from USC. MMHR:Do you have a top five to ten schools you’re looking at right now? STJ: I haven’t narrowed it down yet. STJ: I visited Stanford, San Diego State, and USC. I have no dates set up yet. STJ: I work very hard every day with my dad at least one and half hours every day. STJ: 4 or 5 years old. STJ: It is a combination of academics and athletics. Also, early playing time is important. Being able to contribute to the team my first year will play a role in my decision. MMHR: Who are some of your mentors who helped you get to where you are right now? STJ: Winning state this past year. STJ: Contribute to a D1 program and win another state title. MMHR: Do you have a Facebook or Twitter that you’d like to share? STJ: Steph Curry and James Young. Thank you, to the Thompson Family for allowing us to interview your son. Please keep us informed and upto date on his future recruitment.